Sad news reached the offices of ALR recently of the death of John Griswold at only 65. John had been suffering from Alzheimer’s, the cruelest of afflictions, especially for someone with an encyclopedic knowledge of James Bond. John’s rich legacy however, is his book ‘Ian Fleming’s James Bond: Annotations and Chronologies for Ian Fleming’s Bond Stories.’ Within, are glossaries of applicable terminology and references with detailed chronologies of events including annotations, which are represented at a day-of-week, month, day, year, and even a time-of-day level. Maps were created for many of the novels along with in-depth information concerning specific topics such as, the Moonraker bridge game and the Goldfinger golf game. Differences found between published versions and the original Fleming manuscripts archived at Indiana University’s Lilly Library were also noted. In Moonraker , there´s a mention of the ´girl in the balloon bet.´ I´ve been trying to figure out for years if it was something real. I kept on hunting. Finally, I found a movie producer working on a film in Scotland. He told me it was a reference to a real bet made in the 19th century about whether a notorious rake could make love to a woman in a balloon. Another reason to get this book is the wonderful artwork by George Almond. George’s work has been featured on this site before and it perfectly illustrates some of the sections of this book. Dr. No – Illustration by George Almond with permission, not reproducible. 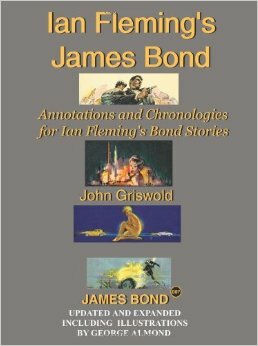 With researched detail that would rival Mr. Fleming, author John Griswold shows us that there is much more fact than fiction in the incredible world of James Bond. Full of surprises, the book is a labour of love that should be both informative and fun for anyone. Ian Fleming’s James Bond: Annotations and Chronologies for Ian Fleming’s Bond Stories officially approved by Ian Fleming Publications Ltd (formerly Glidrose), with a Preface by Andrew Lycett and Forewords by Zoë Watkins, Publishing Manager, Ian Fleming Publications Ltd.; Raymond Benson, author of The James Bond Bedside Companion, six original 007 novels, and numerous non-Bond novels. This is incredibly sad news. One of the key works on Fleming’s books and one I often refer too. In a strange sideline I actually own a signed Cubby Broccoli photograph addressed to John. His book was indeed a labor of love, and a much needed one. As Fleming’s books recede further into history, Griswold’s annotations grow more and more valuable. They are a model to be followed by future editors of Fleming. RIP. A brilliant Bondologist whose work I have very much appreciated.